I stood over Ganondorf’s cold, dead body. The Gerudo King lay crumpled on the floor of a dark castle hallway, left to soak in a pool of his own blood. Throat split wide open. It did not take a true-blue sleuth to see that cause of death. And once again I found myself examining the circumstances behind a corpse, trying paint a picture of the events that led to a man’s unexpected demise. Flashes of King Hyrule’s lifeless body, his yellow-stained mouth, met the call of this familiar scene. I felt a deep pit form within my stomach, less a reaction of the gruesome image before me, and more a realization that my entire case had gone full circle. Ganondorf seemed to have been returning to his chamber when he was attacked. Based on the position of the body, it seemed that he turned a blind corner in this twisting hallway and quickly met the edge of a blade. This particular part of the castle was isolated, obscured, the perfect place for an ambush. Whoever killed him had either been waiting here for him to turn the corner, or had been closely tailing him. Nabooru was nowhere to be found. A part of me wondered if she had made a run for it, enjoying a newfound freedom, or perhaps in guilt, if she were the one that killed her king. I dispatched Impa to search Gerudo warrior’s quarters for any indication of her whereabouts, but knowing Nabooru, she was the kind of person that could only be found if she wanted to be. And without a clear idea of how long her master’s corpse had been laying here, she could have been half-way across Hyrule for all I knew. I searched Ganondorf’s cloak for anything useful, but it seemed that, even in death, the Gerudo King wasn’t going to offer up any information easily. His pockets were empty, and I was left without a clue. I was no more closer to the conclusion of this case than I was an hour earlier. Frustration filled me. Sure, the death of Ganondorf eliminated another suspect, but… was there really any satisfaction in that now? Perhaps Ganondorf had murdered King Hyrule, and paid the price with his own life? I’d never get to talk to him now, so that word was all I was left with. No, I assured myself, I’ll figure something out. I have to. I stepped into the castle courtyard to get some air as I waited for Impa to return. The largest wrinkle in the investigation had just occurred, and I needed the time away to clear my head. Hyrule Castle’s tallest tower cast a deep shadow across the open area, my eyes tracing its angles across the grass. I took a few solitary steps along the outside of the courtyard perimeter, where a line of ancient trees had been planted long ago. Somehow, the heavy shade of the trees seemed less oppressive than the stark shadow of the castle’s towers. Not many people ventured this far away from the main gate too, so I knew I’d get some privacy. As I kicked my feet forward, I heard a, “Psst,” from among the trees. I turned sharply, and saw a faint figure poking out from behind one of the largest trunks. Who, or what, is that? I gripped my sword as I slowly paced forward. One person had already been cut down that day; I didn’t want to be the second. Then, to my utter surprise, from behind the tree emerged Nabooru, her gilded eyes piercing through the veil of shade. I clenched the hilt of my sword tighter. “You seek information on the death of Ganondorf? I have it,” she stated. Her voice was chilling in its bluntness. Nabooru nodded, “Of course, I did.” She half drew her scimitar for a moment, then slid it back into place. “So he was the murderer after all then?” I asked, trying to fully understand the situation that had unfolded. Ruto. So they were working together. I remembered the conversation I had with Zelda’s servant. Under the princess’ orders, Nabooru’s vial had been stolen from her and hidden away. But what of Ruto’s? Her head dropped. She appeared regretful, a rare emotion for a Gerudo warrior. “So, that thing in Ganondorf’s closet…?” I asked. That made sense; he had all but told me the very same in the hall when we last spoke. I recalled the image of Ganondorf’s lifeless body. He must have turned that corner, and was suddenly surprised his own ally standing before him with scimitar in hand. For all his perceived foresight, it seemed that his own arrogance blinded him in the end. It’s too bad that my blade wasn’t the thing to bring him down. I felt that I had received everything I could from Nabooru at the conclusion of her tale. I bid her farewell, assuming that she would return home to her people to report Ganondorf’s death. I sighed as the door to the royal family’s shrine to Nayru shut with an audible click. I stepped forward to once again face the altar. Instead of returning to my table, and the stack of notes I had on my case, I knelt once more beneath the glass eyes of the patron goddess of Wisdom. Funny, how much I had asked of Nayru in the past afternoon, considering that in my past, if I prayed, it had been from Farore that I sought guidance. Did goddesses send messages to each other? I pondered the thought of a mere mortal sending a divine being on a mission to deliver a message. I’d probably be smited for such insolence. Well, maybe if it were Din. She’s the fiery one after all. I was close to a conviction, I thought, but I needed to connect just a few more dots. Whose poison ultimately slew the king? And who administered its dosage? My eyes were drawn back to the flower offerings Zelda had made at the base of the shrine, and I suddenly remembered the little glittering fairy light I had seen within one of them. The more wilted of the bundles, this one bound in a white ribbon. Glancing back over my shoulder to the door, I paused for several minutes to ensure I was alone. This was not the sort of thing I would normally do, but I had to know what was in those flowers. Something inside me just could not let it go. The only thing that greeted me from outside the room was silence. I turned back and carefully lifted the bundle off the pearl stair. Carefully, delicately, I pushed the flowers apart, doing my best not to harm them or loosen their bonds. I could see something tucked inside, barely peeking out to catch the light cast by the torch. I poked two fingers inside and tried to grasp it. It took a couple tries, but eventually, I managed a firm enough grasp and slowly pulled it out. I felt my heart race; my vision tunnelled as every single word, every single clue started snapping together like puzzle pieces. I heard each voice in my head once more. My hands shook as I held it. So badly, I had wanted to believe her. So badly, I had wanted her sincerity. I had blinded myself to the truth because I couldn’t handle what it could possibly be. And then it hit me, right in the face, and I couldn’t look away. She let me into her study. I am not really sure why, to be honest, because I know my fury showed on my face. I can’t really describe what I felt, in my chest, in my core. A flame had been lit within me, and it had spread into this raging inferno the more I thought through the truth. What had been in front of my eyes the whole time. She guided me to sit once more in her chair, but I refused, standing with fist clenched around that vial. Clear, mostly, save a pale yellow stain near the bottom. Glass. Identical to the one Mutoh had given me that now resided on my small table near the shrine. A vial once containing a certain specialized poison, the Seven Year Sleep, found in the belly and chalice of the late king of Hyrule. I recalled the conversation I had had with her servant. Zelda blinked at me, patiently waiting for me to begin, but words had fallen aside. I tossed the vial at her; she caught it. After a moment, her expression relaxed. Like a burden had just been pulled from her shoulders. Like she’d been relieved. “Did you think I would never discover the truth, then?” I seethed. That made me sit. Hard. With a growl, as I ripped my cap from my head and ran my hand angrily through my hair. “Start from the beginning,” I demanded, not sure if I truly wanted to hear it. I did not want to hear her speak at all. Could I even trust what she said? Yet, I needed the truth. I needed to hear her say it. “How?” I interrupted, not really giving a single hair on a horse’s backside that I had just cut off the reigning matriarch and Heir Apparent. To me, she no longer deserved those titles. She did not deserve to be a descendant of Hylia. “Ganondorf wasn’t the only one with eyes on all parts of the kingdom. I had my own little birdies keeping me informed. I knew he was recruiting others to take part in his cause. I knew he threatened the Gerudo’s relationship with Hyrule, his entire nation’s very livelihood, by plotting the king’s death.” She turned to face the light coming in through the window. “Why didn’t you tell His Majesty, then?” I asked. My body tensed up. I felt that the person before was no longer the princess I had known all my life. She was different now. I realized then that for only one reason Ruto still kept her head, even though Zelda knew her secrets. The kingdom had seen its fair share barely a generation ago, and still struggled to completely stand in recovery. My own history, the first year of my life, and the princess’s life, too, had been burned with the flames of war. The taste was still fresh, the wound still painful to the land. I growled and lay my head in my hands. This twisted game was not one I was cut out for. But Zelda was. And she played like a master. Like a goddess, benevolent and malevolent. I both pitied my homeland and felt assured in its protection. The white mask. Another piece snapped into place. “To stop a theoretical war,” I reiterated, punctuating every word. I stared off with the her, my anger subsiding into the lowest, deepest, most cutting sense of defeat I had ever known. I had fought with sword and shield, risked my life against threats and fears in this land, and several times, I had barely scraped onward by the skin of my teeth. But never before had I known what it was like to lose. Zelda had played me, and I had let her do it. The worst part, though, of the whole thing? Is that I knew the plan would work. She’d make it work, somehow, and it would be for the greater good of her people, and all the people of the land. Ultimately, I knew that’s what this was about, what she had always sought out and cared for, before anything — or anyone — else. The greater good of Hyrule. I can’t say she’s wrong. I knew I never would. No one would ever know the truth of who killed the king. Zelda stood and slowly crossed the room, hands clasped at her chest and chin lowered, as if in prayer. She stood, back to me for a couple moments. Bold, I thought. And perfect. And I did not want to be around to see it through. I wanted to be as far away from Hyrule — from her — as I could possibly be. Starting right in that moment. I stood and made my way wordlessly to the door. I glanced back and met her beautiful blue eyes. It was the last time I would ever see them. But it was not my friend who looked back at me. It was not the girl I had grown with, who held a part of my heart, and whose heart I knew I held. Princess, Heir Apparent, Sage, the new leader of Hyrule. She blinked, her crown catching the light. “Me, too,” I said, and I left, letting the door close behind me, for the last time. I walked out of the castle in a daze, returned to my home, gathered those things that did not hold such painful memories of a land and love betrayed. And, amongst fierce heartache, I left Hyrule, never to look back. 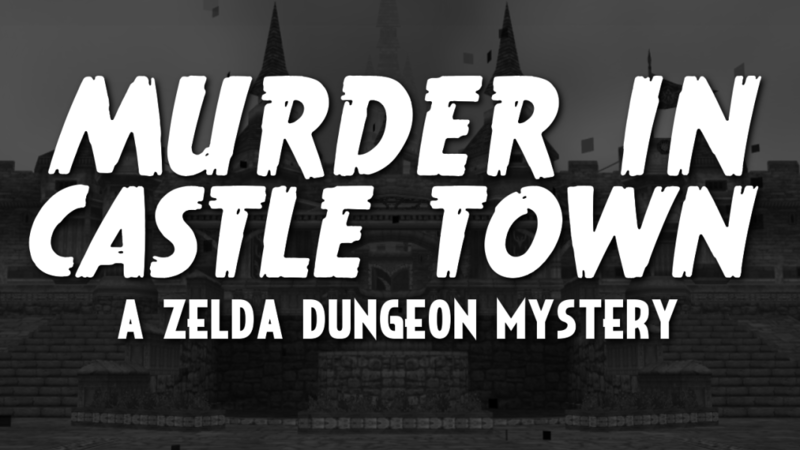 Murder in Castle Town is a collaboration between Rod Lloyd and Kat Vadam. Follow them on Twitter!